Taylor's Hybrid Acoustic-Electric Guitar Changes the Game! 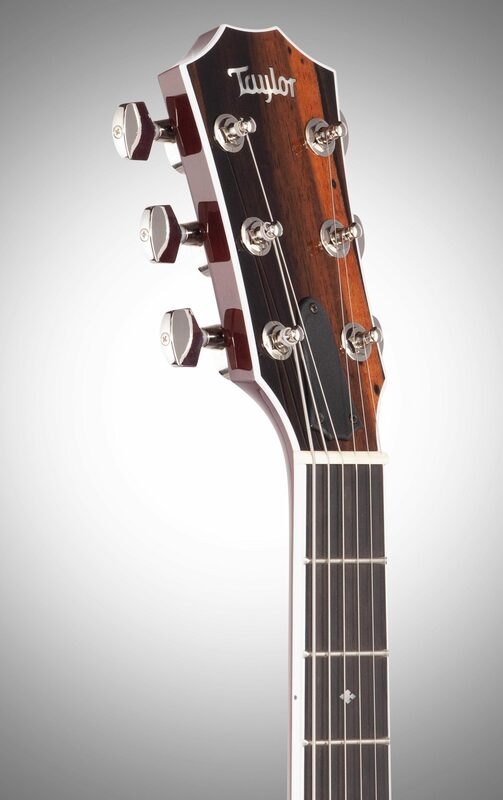 The Taylor T5z Standard is an innovative acoustic-electric guitar with an entirely unique sound and feel. It challenges everything you thought you knew about electric guitar design, and plays with phenomenal response and nuance. The year the Taylor T5 was introduced, it won simultaneous prizes for Best New Acoustic and Best New Electric Guitar! And the T5z model raises the bar even higher, with a slimmer build that's more comfortable for electric guitarists. If you haven't played one yet, you really owe it to yourself to discover Taylor's masterpiece of forward-thinking design. 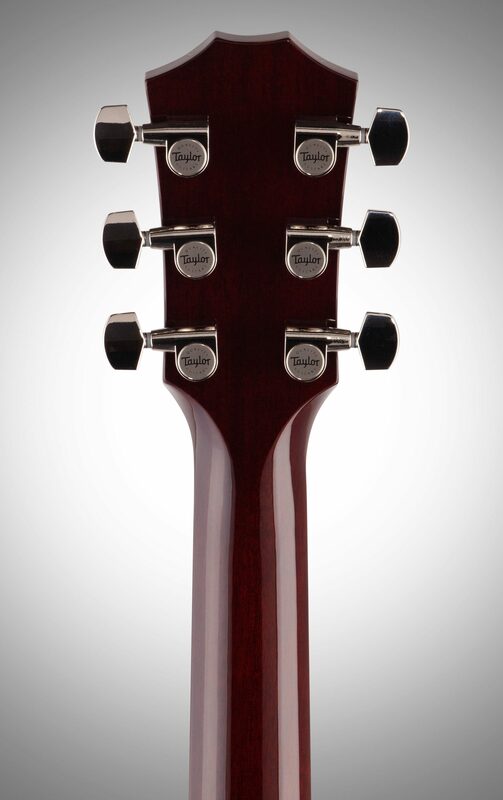 The T5z uses select sapele in the neck, heel, back and sides, which is matched tonally to a Sitka spruce top. The unique internal bracing pattern follows the patented design found on the original T5 models. Even if you strum a chord when the T5z isn't plugged in, you'll immediately hear its rich, crisp voice. The 12-inch radius ebony fretboard is carved to ensure perfect intonation at every point on the neck, and is set with super-comfortable jumbo frets. When you play the T5z, string bends feel effortless -- yet sustain gloriously. In addition to its one-of-a-kind body design, the sound of the Taylor T5z is derived from the presence of the T5 electronic system and its 5-way position switch. With two custom-designed humbuckers and a separate acoustic body sensor, the T5z brings the best of two worlds together and yields astonishing tonal range. 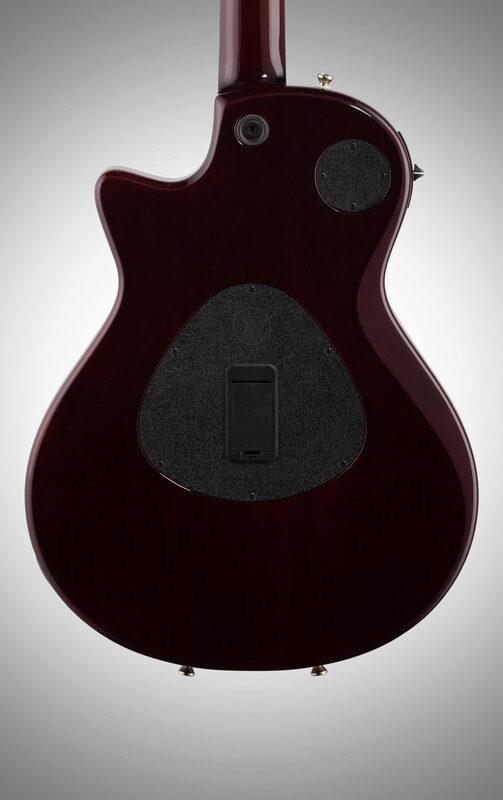 Position 1 combines the output of the Neck Humbucker and the Body Sensor. This is undoubtedly the coolest feature on the T5z, and opens up a vast tonal palette. By fine-tuning the controls for the pickups and the sensor respectively, you'll be able to explore a wide range of sounds and colors. Position 2 employs the Neck Humbucker to get a warm, round tone. If you roll back on the Treble here, you'll get sounds perfectly suited for jazz and swing styles. Conversely, if you pull back on the Bass, you'll get more of a solid body electric sound suitable for rock and metal. Position 3 employs the Bridge Humbucker, and is possibly the most versatile single setting. This one pickup can serve up sounds ranging from bright twangy leads to and searing overdriven leads or chords. Position 4 puts the Neck & Bridge Humbuckers in parallel and creates a clean sound reminiscent of a vintage hollow or semi-hollow body. With just a little chorus and/or verb, this setting instantly transports you into a realm of vintage shine and sparkle. Position 5 puts the Neck & Bridge in series and creates a dark, full tone that is as compelling as it is hard to describe. It sounds like an even larger hollowbody in this position, and is well-suited for deliving thick rhythm playing as well as distorted, singing leads. 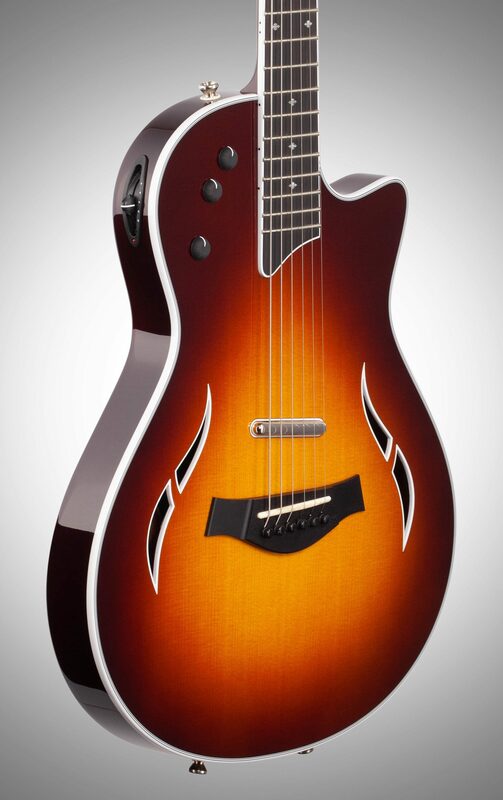 The Taylor T5z features dual crossover compatibility with electric and acoustic amps. With so much intrinsic range, the Taylor T5z and is more than ready to take your guitar playing in a completely new directions. Want to hear a cool guitar solo? Wayne Johnson performs on the T5z Pro -- a sister guitar to the T5z Standard! 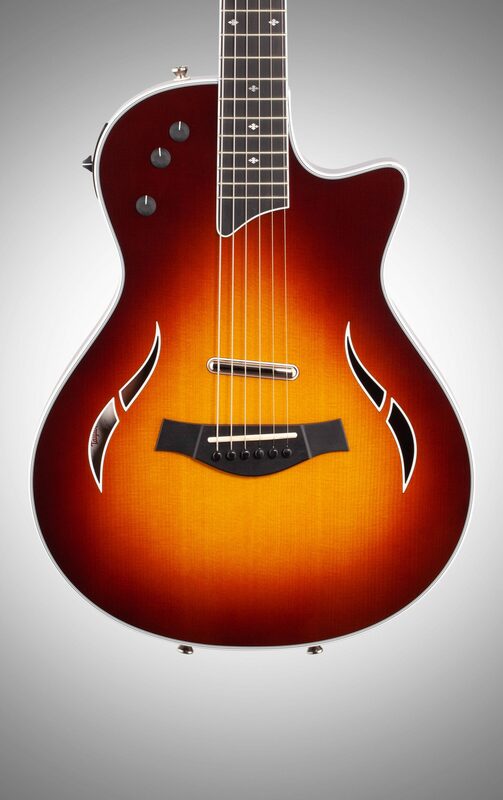 Say hello to the T5z Standard, the innovative addition to the Taylor T5 family. 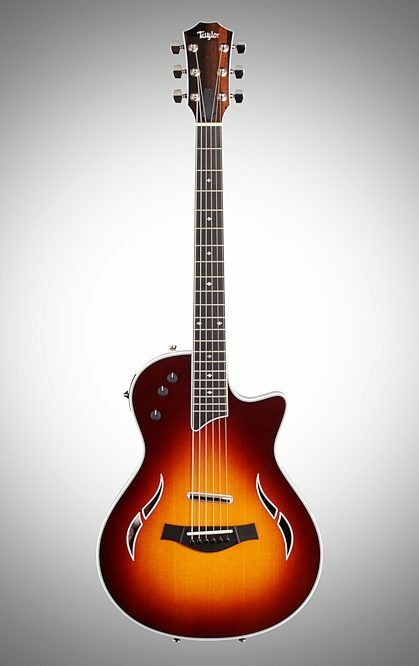 Designed with electric players in mind, the T5z brings more of an electric guitar look and feel to the popular hollow-body hybrid electric-acoustic T5 series. Electric-friendly features include a more compact body than the original T5, plus a 12-inch fretboard radius and jumbo frets that making bending strings easier. If you're looking for a versatile stage or recording guitar that blends the feel of an electric with a full range of acoustic and electric tones, the T5z gives you an essential musical tool. Like the original T5, the T5z bridges the electric and acoustic worlds like no other guitar, unleashing a sweeping array of amplified tones. 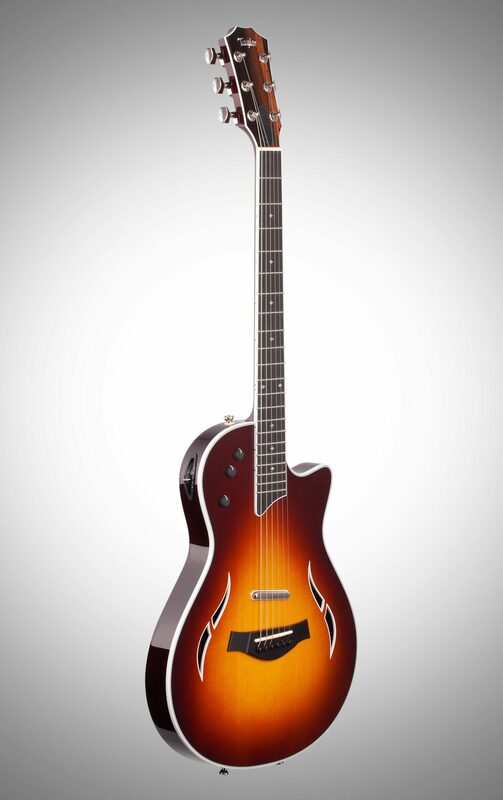 The hollowbody design features an active soundboard to produce a natural acoustic voice and incorporates three pickups: an acoustic body sensor, a concealed neck humbucker, and a visible bridge humbucker. Crossover design features include dual compatibility with electric and acoustic amps, plus five-way switching and onboard tone controls that let you shift from shimmering acoustic to screaming electric in an instant. We were lucky enough to get our hands on the T5z -- and this thing really smokes! The redesigned Taylor T5z line furthers Taylor's entry into the acoustic-electric world with a smaller-sized instrument that just flat-out rocks. Two electric pickups, plus a piezo acoustic pickup, deliver just what you'd think they would: a wide array of tones suited for any style of music. This guitar has all of the great feel and playing ease Taylor is known for -- coupled with a smaller, more comfortable body and amazing-feeling 12-degree-radius neck. 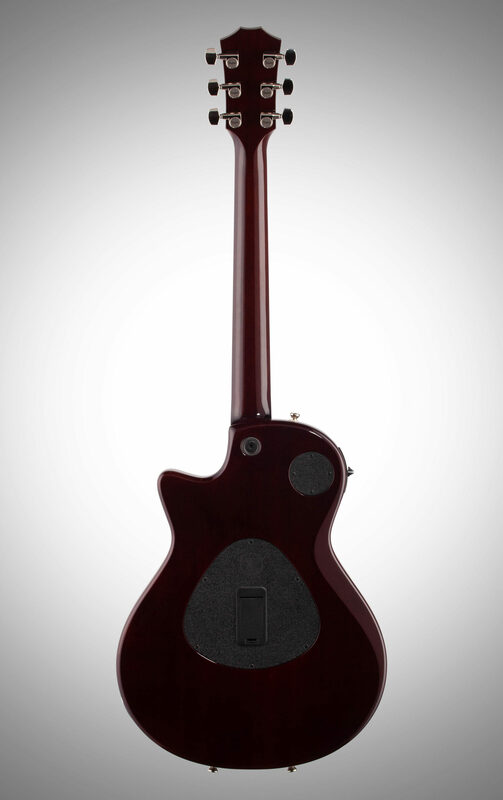 Players wanting an acoustic-electric all-in-one guitar: you have no excuse not to grab one of these immediately!